Today's work brings us Weepinbell, a Pokemon who screams "derp"...and what better to emphasize this nature with googly eyes? In today's case, the style I went for should scream "arts and craft", with the usage of the googly eyes to pave the way of layering separate pieces of material one on top of the other. In fact, doesn't this remind you of Kirby's Epic Yarn? 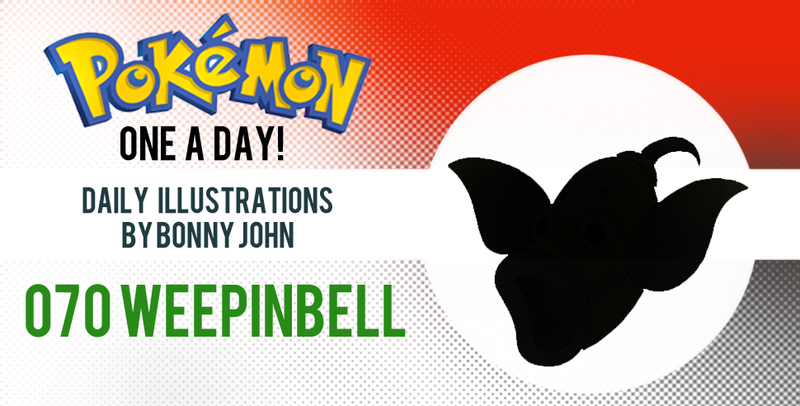 Weepinbell is a pretty simple design - to me its boring - but it gets the job done and that's what matters most. To add complexity to the simple nature of the Pokemon, I used this direction to make the work interesting visually. As an evolution to Bellsprout, it does well to build off of the first form, and gives us great insight on what is to come. I broke down the major aspects to the Pokemon and created this piece little by little, layer by layer. As an illustration, I visualized the end from the get go. Getting to the final form of the art, I cleaned up each layer by splitting the pieces down the middle and duplicating it. That way, I got a nice symmetrical balance to present the work cleanly. I ran each piece through Photoshop filters to create a good balance of textures and patterns to make Weepinbell complete. Weepinbell can't be posed in a lot of unique ways -it's body is counterproductive to that- so I emphasized the bell aspect of the Pokemon, including making it's tongue/clapper? appear like a real bell's. That wraps up today's art! Hope you enjoyed the direction of today's illustration and reading how I came to this end result. See you tomorrow with Victreebel!